Before my mind fully transitions into weekend mode, I wanted to take a few moments to reflect on what seemed like another whirlwind of a week and the pep talks I needed to get me through. 1. You are more than capable. Self-doubt is an every-other-day demon in my life. I have to remind myself: Whatever the challenge or task, you have the ability to tackle it. Don’t let fears of the unknown continue to paralyze you. Don’t force yourself into a psychological meltdown by filling your head with worst-case scenarios of failure and fallout. As long as you put forth your best effort, that’s all that matters. You got this. 2. There are things in your life that you cannot control. Huh?? About half of the time I hear this from my loved ones, it goes in one ear and out the other, which makes it a much harder pill to swallow when I muster up the courage to repeat it to myself. Those who know me well will tell you I’m a bit of a control freak, and even when it’s clear that I have lost the battle for control of any given situation, I still find it difficult to let go. I’m a worrier, but I’m learning and relearning that I can’t worry about the things that are out of my reach. And not everyone can handle that. You don’t need to exert any energy on convincing someone how wonderful you are. Just be you. 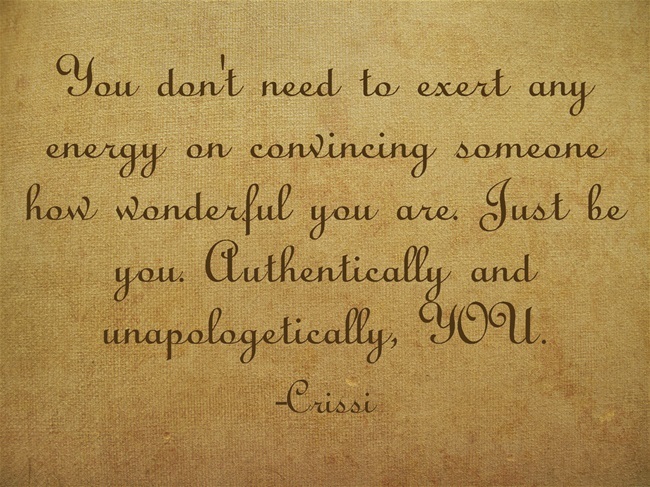 Authentically and unapologetically, YOU. Over the past few weeks I’ve been dealing with the unraveling of a relationship that I’ve cherished for years and it’s arguably been one of the most trying and teaching experiences I’ve gone through in my almost 25 years on this earth, and it’s still a struggle. But, as a friend reminded me: “sometimes God puts certain people in our lives for a season, while others are around for a lifetime.” Now is the perfect time for me to be a little selfish and focus on my awesomeness. I hope at least some of my words have resonated with you in some way. I would love to know: What things did you tell yourself this week? Feel free to comment below. You are quite welcome. Thanks for taking the time to read this post! Wow! Definitely words of wisdom to live by. Glad you took something away from my words; thanks for reading!